Garlic soup. The name sounds wan. It sounds like a thin, aggressive soup with bracing bite. It sounds like the type of soup that’s medicinal, where the sharpness makes it difficult to keep eating even as you know it’s good for you. It sounds unpleasant. But that’s not what you get. Instead you get something rich. Something creamy. Something with a warm sweetness of roasted garlic without the time commitment, with woodsy earthiness from rosemary and a hit of brightness from lemon. You get a sophisticated soup. You get a soup that’s been transported from a warm bistro on a rainy night to your dining room table. You get something light enough for a healthy lunch, and decadent enough as an impressive starter for a dinner party. 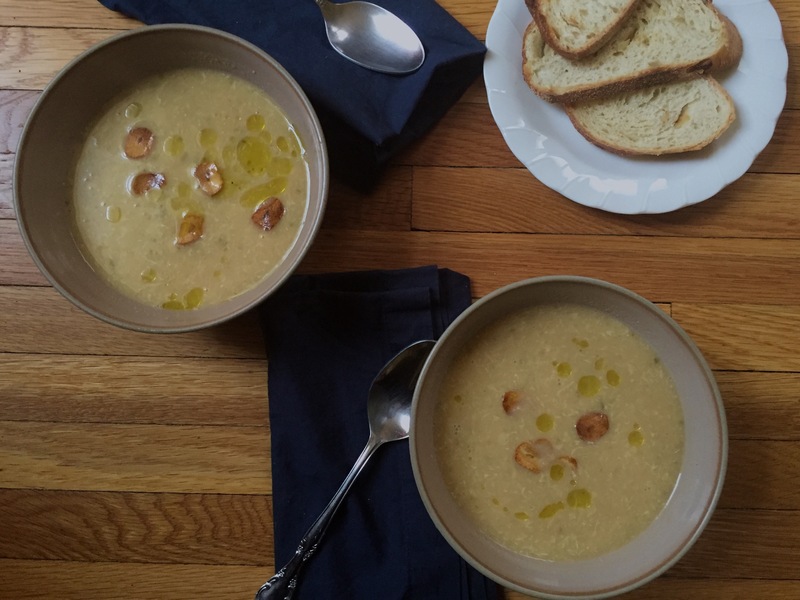 Garlic soup, despite its lumpy sounding name, is a good thing. Just imagine. You sweat an onion until it’s sharp edges are mellowed out then add in a mess of garlic. When everything smells fragrant and heady you stir in some rosemary, lemon zest, and stock (I used Better than Bouillon, but homemade would be incandescent). The whole thing bubbles away, becoming concentrated and savory and rich, and then it’s blended up and has eggs and sherry vinegar whisked in. If you want to gild the lily, you could top it with garlic chips and a drizzle of good olive oil. And it comes together in about 30 minutes. If that’s not enough tempting enough for you, consider this. I’ve been laid up with a cold. Then I made garlic soup. My cold is now retreating. That may be coincidence, true. Or it could be evidence of garlic soup’s magical properties. It doesn’t taste medicinal, but it is healing. The fastest way that I’ve found to mince a large amount of garlic is to peel apart the cloves and then smash then using the flat side of your knife. The paper comes apart easily, and you can chop the garlic inside much quicker. In a large pot warm the olive oil over medium heat. Add the onion and a sprinkle of salt, cooking, stirring occasionally, until softened but without color. This should take about 5 minutes. Add the garlic and cook, stirring frequently, until cooked but without color, about 2 minutes. Add the rosemary, the stock, and the lemon zest. Bring to a boil, season with salt and pepper, then lower to a simmer. Simmer for 20 minutes. In a small skillet warm one tablespoon of oil. Saute the two cloves of garlic, stirring often, until golden brown, about two minutes. Remove and drain on a paper towel. Whisk the egg yolks with the tablespoon of sherry vinegar. After the soup has simmered, blend, either in batches in an upright blender or with an immersion blender. Return to the pot if using an upright blender. Very slowly, whisk the egg whites into the warm soup, beating constantly. You want to go as slowly as you can so the egg whites don’t cause large streaks. After the egg whites are whisked in, slowly whisk in the egg yolks, beating constantly. Taste and adjust for seasoning. Serve immediately, toppped with garlic chips and a drizzle of olive oil. I was making Deb Perelman’s ricotta blood orange cake on Monday when I noticed something troubling. My oven was too hot. 75 degrees too hot, to be precise. I spent the whole time that it was baking fiddling with the nobs and opening the oven door to regulate the temperature. It was one of the more stressful cakes I’ve made in recent memory. It turned out beautiful, and was devoured at the dinner party we attended. But it was not an experience I was keen to repeat. One email to my landlord and one landlord visit later I got good news. We’ll be getting a new oven, to replace our ancient one. In a week. Or two. I’m beyond excited, but still have want to feed myself and Aaron while we’re waiting on our new oven. Ironically, this is close to a repeat experience from our old apartment, where our oven also ran 75 degrees too hot minus the caring landlord. I’m casting back to those ideas for ideas on how to feed ourselves in the next week. We used to eat, and will be eating a lot soups, and stews. I’ll turn on the oven for things that like high heat and don’t need pr, like roasted vegetables, and maybe even pizza. There are worse ways to suffer. 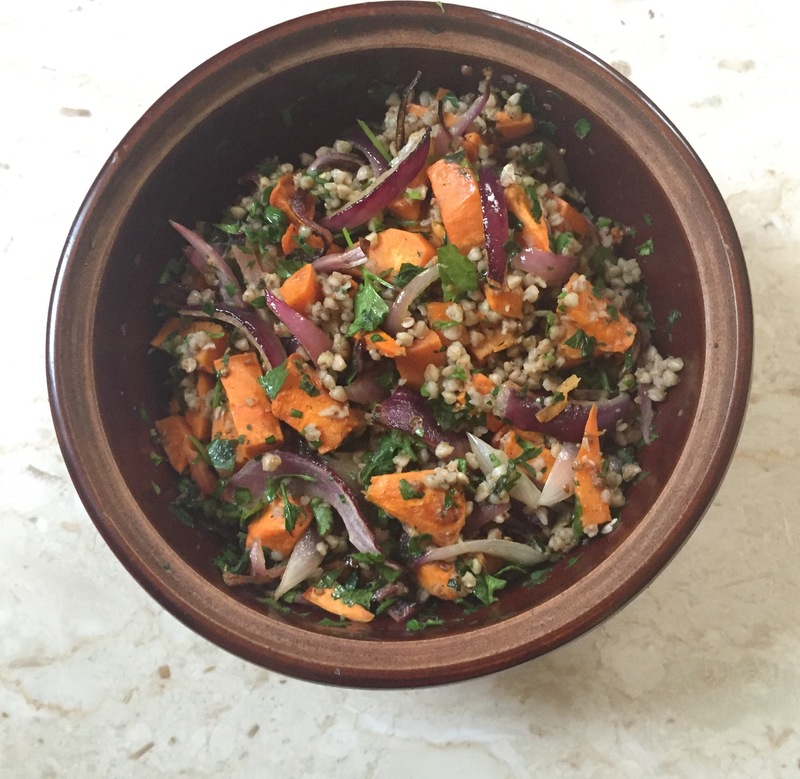 I braved the oven to make this sweet potato and buckwheat salad for an easy lunch. It’s a riff off of a butternut squash and buckwheat salad from Anna Jones’ very smart A Modern Way to Eat, which I’ve visited here for her hot chocolate before. Sweet potatoes and red onions get roasted with coriander seeds and blood orange juice, and then tossed with earthy buckwheat and a riot of parsley and cilantro. The result is bright from the coriander and cilantro (which are the same plant, just the bud and leaf respectively), slightly sweet from the blood orange juice, and nutty from the buckwheat. One of my New Year’s resolutions was to cook with one unfamiliar ingredient a month, and January’s was buckwheat. And after some misses (soggy kasha, I’m looking at you), I’ve found a great vehicle for the malty, rich flavor of buckwheat to shine through. The blood orange gets juiced twice here- once over the vegetables before they are roasted, and once over the finished salad after the orange itself has been roasted. The two additions add a nice, layered sweetness, and I’ll be repeating the gesture when I make this salad again. If that seems too fussy for you, it would still be very tasty with the orange added either entirely at the beginning or entirely at the end. In a large bowl combine sweet potatoes and red onion. Cut the blood orange in half and squeeze juice over the vegetables. Add in the coriander seeds, 1 tablespoon olive oil, 1/2 a teaspoon of salt, and the black pepper. Stir well so that everything is coated together. Turn out onto a cookie sheet or two, add in the blood orange halves, and roast until the onions are fragrant and the sweet potato is cooked through, about 25 minutes. Heat one tablespoon of olive oil in a skillet over medium heat and add the buckwheat groats. Toast, stirring frequently, until the buckwheat begins to smell malty and small brown dots begin to appear. Place the buckwheat in a small pot. Cover the buckwheat with 1 cup of hot water and bring to a boil. Turn the pot down to a simmer and cook the buckwheat, stirring occasionally, until it is cooked through and no longer chalky tasting. This should take about 15 minutes, but take care to watch the pot and add a quarter cup or so of water if necessary. If the buckwheat has cooked through while water still remains, drain the water. In a serving bowl combine the roasted vegetables, the buckwheat, and the chopped herbs. Carefully squeeze the rest of the blood orange juice over everything. Drizzle over the final tablespoon of olive oil and the last 1/2 teaspoon of salt. Stir well and taste, then adjust for seasoning. Serve warm or at room temperature. Saturday, 8:25 AM I’m still in the clutches of sleep as I toast some hippie 16 grain bread and get dressed for work. The toast gets a thick coating of half an avocado, a treat because Aaron bought avocados for tacos and then forgot about them. The toast has the correct ratio of creamy to crisp but no heat. I didn’t add enough red pepper flakes. Or I forgot to add them. I pour boiling water into my thermos with a bag of Earl Grey, gather up my knives, kiss the sleeping Aaron goodbye, and run out the door. 9:01 I’m late by a minute, which is typical. Restaurant #1 has an open kitchen and my station is set next to an enormous window. It’s bright and cheerful, waking me up as much as my tea. We bustle about setting up our station in time for the brunch to start. I don’t finish setting up until 10:05, but there’s no one in the dining room by then so it’s nothing to worry about. 11:15 Our chef is trying out a new dish, a modern riff on a tuna noodle casserole. I steal a handful of rigatoni that he just cooked and snack on it. I’m starving. He fake yells at me. I tell him I like the amount of chew in the noodles. He puts up a sample of the tuna noodle casserole as a tester just as we get a mini-bump. The casserole is all gone by the time I can leave my station again. 1:30 It’s slow enough that I can roll out tart dough in the back for a dinner dish. I get as many tart shells as their are mini tart pans out of the dough and still have some dough leftover. I peel and dice an apple, then toss it with flour, sugar, and cinnamon. That goes into the rolled out leftover dough, which is turned and crimped. I brush the top with some leftover scrambled eggs, demerera sugar, and more cinnamon. The whole thing gets thrown in the deep fryer. This is going to be, in the restaurant parlance, gross. My station mate comes in and we compare notes from service. Chef has been doing admin duty, but comes back to the kitchen to tell me I can head out now. We’re slow. No one wants to go outside for brunch when it feels like -20. 2:15 Brunch is over and cleaned up. The deep-fried apple pie has been ravaged. I like the filling, but I think it needs a different crust. Someone suggests wrapping the apple filling in our biscuits and deep frying those. This is not a healthy place to work. I clock out, then use the last of an avocado for a brunch dish to fill one of our bagels and scarf it down. 3:10 I usually work at Restaurant #1 until 3, then head over to Restaurant #2 by 4 where I do pastry. But since I got out early today I drive to Restaurant #2’s neighborhood and head to a coffee shop. It’s a local chain and I love how much attention to quality they have, but each shop reflects its neighborhood. Restaurant #2 is in one of the wealthiest neighborhoods in Minneapolis and it’s reflected in the coffee shop. There’s lots of glass, marble countertops, and uncomfortable, backless stools. It’s beautiful but cold. I order a pot of Assam tea from the hipster-ish barista and find a spot at the common table. Usually it’s packed, but no one wants to be out when it’s -20. I read for half an hour while sipping my tea. It’s strong and bitter and is only sweet on the aftertaste, just as I like it. My pants are dusted with flour and my hair is a mess. The whole time I wonder if I’m being judged by the well-heeled customers or if I’m judging them for being well-heeled. 3:52 Restaurant #2 is much larger than Restaurant #1 and the kitchen is filled with at least a dozen people. There are three of us on pastry tonight- our Pastry Chef, S, and myself. We could manage with 2, but this way we’re able to get big projects done when no one else is prepping without compromising the quality we’re sending out. I set up the station as S is making brittle and Pastry Chef is spinning ice cream. The tickets start coming right at 5. 6:30 Pastry Chef orders a burger for us from the line and we split it in three. She also grabs each of us our preferred mode of caffine- decaf for her, regular coffee for S, black tea for me. I have a serious girl crush on Pastry Chef. We each scarf our burger, salty and oozing and cut with one crisp, tart pickle each. Why so few pickles? We agree this ridiculous. 9:30 Because there are three of us and I worked brunch this morning I’m cut when the projects get done. At work I was fantasizing about a shower, a cup of herbal tea, and writing. Instead I take a shower and lay in bed looking at my phone while thinking about herbal tea. I’m hungry but trying not to eat late at night and Aaron’s out bartending as a favor to a friend. I persuade myself against cooking. 10:30 I finally make mint tea and write. As an exercise I start to list what I’ve eaten today. I do the math and figure out I ate about a thousand calories today. Uff da. 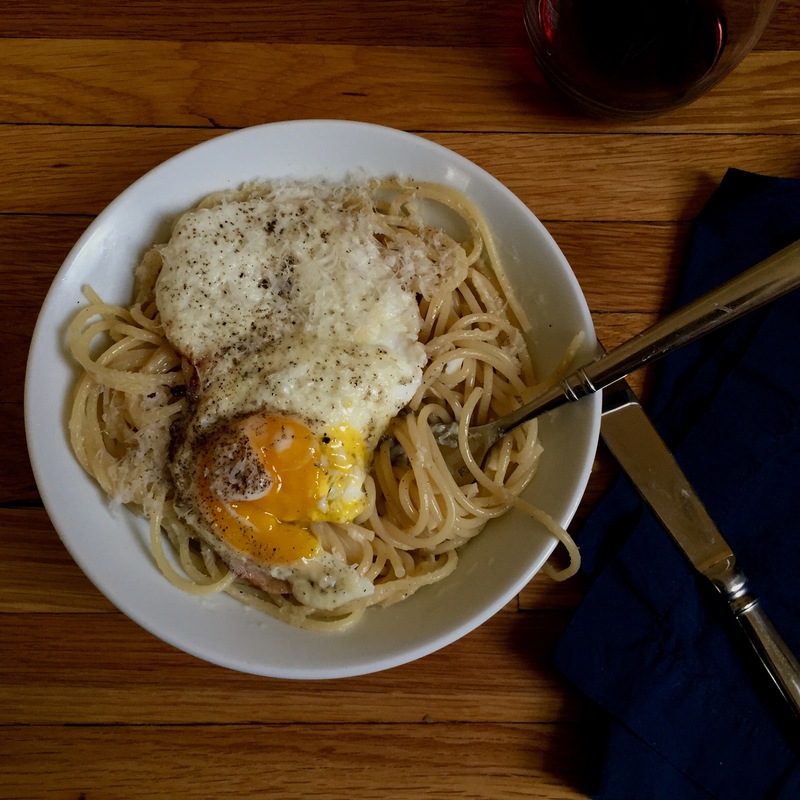 11:00 Sit down to dinner- spaghetti bathed in butter and black pepper, topped with a fried egg. Normally I’d grate parmesean over the whole mess but our parmesean has turned into a rock from disuse. Instead I microplane scraps of a cheese (goat?) I found in the refrigerator into flurries over the egg. It’s good. It’s salty and biting and floral and rich and warm and it’s better than almost anything I can think of right now. It came together fast and easy and right now I’m infatuated with this spaghetti. Devour. Do dishes. Go to bed. Repeat day as necessary. This is not so much a recipe as a list of ingredients and techniques. You can scale this up as needed, and dress it up as you desire. In a large pot set water to boil. Once the water is boiling salt it well, then add the spaghetti. Stir once or twice to make sure the noodles don’t stick together, then cook until the spaghetti is al dente- tender but not flabby. The time changes based on the brand of noodles, but is normally somewhere between ten and twelve minutes. In a small skillet melt a small knob of butter over low heat. Crack an egg into the melted butter. Season with salt and pepper and let it cook gently and slowly until the white is set and the yolk is custardy. Drain the finished spaghtti. Toss with another small knob of butter and a sprinkling of black pepper. Grate some of the cheese over the pasta, then top with the fried egg. Sprinkle more cheese over the egg. Eat. I first heard about Blue Zones when I was in college. The governor of Iowa had invited the Blue Zones researchers to help Iowa become the healthiest state in the US. The town I went to college in was applying to become a manufactured Blue Zone and everyone was talking about it for a month. Pins that read “Blue” were being handed out around campus, articles from NPR on Blue Zones flew around Facebook, and I wrote an article for my journalism class interviewing local business leaders about the push on the ground. Our town ended up not being selected (it may have already been too health-minded, with its organic co-op on main street and refusal to allow Wal-Mart within town limits) and the attention waned. I never quite forgot about Blue Zones. I’ve always thought it would be cool to live in a place where long healthy life is the norm, even if that didn’t seem like a real possibility. And in that vein I picked up The Blue Zones Solution by Dan Buettner, the researcher who first identified Blue Zones, from the library last week. Blue Zones are the places on the planet with the highest concentration of healthy centenarians. The ways these people reach such healthy old age are simple- they eat a mostly plant based diet (eating fish or meat an average of about 5 times a month), have close friendships and families, belong to a faith community, and destress with both reflective pauses and a glass or two of wine. They take a great deal of pleasure in their food and have natural movement (exertion such as walking to work rather than CrossFit) worked into their daily schedule. Simple, but not quite how my life always looks. But I would like to live to be a hundred, and there are ways I can change my life to be closer to the Blue Zones ideal. I can walk more and take my car less, trade a shot of whiskey after work for a glass of wine, and make an effort to see the people I love more. And I can eat more like people in the Blue Zones. People in Blue Zones eat a lot of legumes, whole grains, and vegetables, eat some fruit, meat, honey, dairy, and eggs, and eat very little sugar, refined grains, and processed foods. They drink coffee, tea, wine, or water, and shun pop and fast food. Simple enough, and with the right accents, easy and delicious. 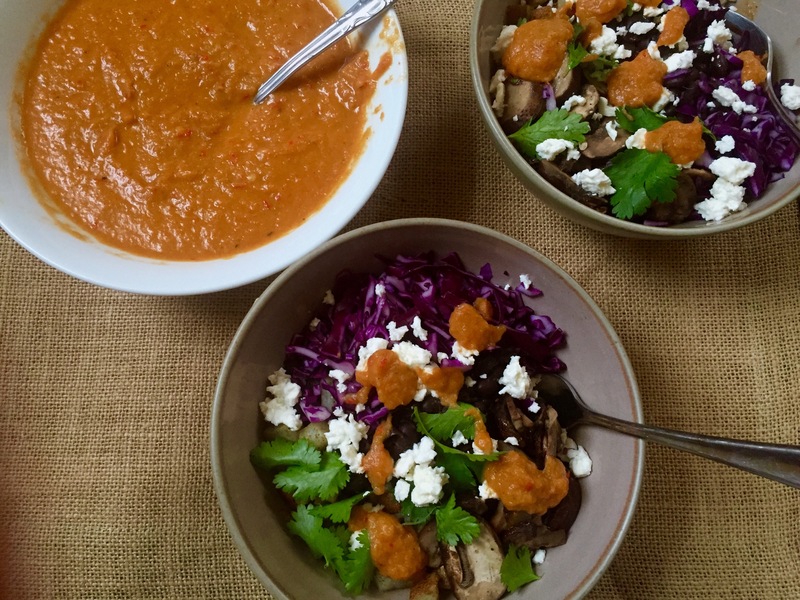 Inspired by Blue Zones, I pulled together these longevity burrito bowls. I simmered black beans with garlic and chilis, roasted onions and peppers together for salsa, and filled the bowls with a wide variety of vegetables, both raw and cooked. It’s filled with foods Blue Zone friendly foods (brown rice, black beans, potatoes, mushrooms, garlic) that make for an earthy, warming meal. The brown rice, when slow cooked, has an almost buttery richness and a nutty taste. The black beans have a low hum of heat, and the mushrooms and potatoes give the whole thing heft and savoriness. Topped with red cabbage for crunch, cilantro for brightness, feta for a creamy saltiness, and a kicking onion and fresno salsa, this burrito bowl is an excellent one-bowl lunch. It’s both hearty and vibrant. If you’d like to learn more about Blue Zones, you could check out either of Buettner’s two books, read this New York Times profile, or check out this NPR article. Although there are quite a few components, it’s pretty easy to pull this together. I cooked the beans the day before everything else. The day of I cooked the rice, roasted everything, blended the salsa, and assembled the bowls. Everything here could be made ahead of time, if you need to. The beans and salsa both make more than necessary for this dish, so you could easily freeze half for next time, or utilize them in a different meal. And if you don’t want to be bothered cooking beans, then I would drain two cans of black beans, cover with water, and bring to a simmer with the chilis, garlic, and cumin. Drain the black beans. Combine the drained beans in a medium pot with the dried ancho chilis, garlic cloves, and ground cumin. Cover with water. Bring the whole thing to a boil, then lower to a simmer. Simmer the beans, stirring occasionally and adding more water as needed, until the beans are tender and tasty. You want to make sure that there’s some broth to the beans. Set aside. Drain the rice. In another medium pot combine the cup of soaked rice with 2 1/8 cups of water and a healthy pinch of salt. Bring to a boil, then cover and turn down to a very low simmer. Simmer until the water is absorbed and the rice is tender, about 30 minutes. Once the rice is cooked, stir well, remove from heat, and replace the lid for another 5 minutes. In a large bowl combine the leeks, onions, garlic, and fresnos with the olive oil, cumin, coriander, cinnamon, and a pinch each of salt and pepper. Toss well. Spread out onto a cookie sheet and roast until the edges start to darken, about 30 minutes. At the same time, toss the diced potatoes in a bowl with one tablespoon of olive oil, the cumin and coriander, and a pinch each of salt and pepper. Spread onto a cookie sheet and roast until the center is tender and edges are crispy, about 20 minutes. Toss the mushrooms in a bowl with the remaining tablespoon of olive oil, salt and pepper. Spread on a cookie sheet and roast until they start to shrivel, about 15 minutes (we want to keep the potatoes and mushrooms separate because they roast for different times). To finish the salsa transfer the roasted salsa ingredients to the jar of your blender. Add in the lime juice, and begin to blend. Add enough hot water to create the consistency you’re looking for- you want something loose-ish. Season with salt to taste. To assemble, place a scoop of rice in each bowl. Ladle some black beans and their broth over each rice, then top with the roasted potatoes and mushrooms. Top with shredded red cabbage, feta, cilantro leaves, and the salsa. Is it too late to talk about New Year’s resolutions? I know it’s already been 2016 for a week and I’ve already published my first post of the year. And I know we’re really not supposed to care about New Year’s resolutions because we can choose to make a change any day. To wait until January 1st to make a change is to lack the will to change. Or so judgy blogs have told me. Despite this questionable advice I like New Year’s Resolutions. There’s something freeing about having a dedicated time to sit down and think about change. January offers a chance to reset after the storm of December. And while you can make goals at any time, there’s something to the rhythm of life that New Year’s resolutions provide. Another year, another time to reflect. I’m not all about the “New Year, New Me”, but rather choosing to make gradual changes to help be the best version of myself. This year I’ve resolved to post more here, to stop using my phone in bed, to walk more, to spend more time with friends, to try out new ingredients and techniques, and to work on getting my college Spanish back up to snuff. Nothing too crazy, just moving in the direction I want to be. Maybe you’re making resolutions. Maybe you’ve promised to cook more or eat more veggies or waste less. Or maybe not. Maybe you just came here to find a good meal for dinner. Whatever the case I’ve got a great one for you. 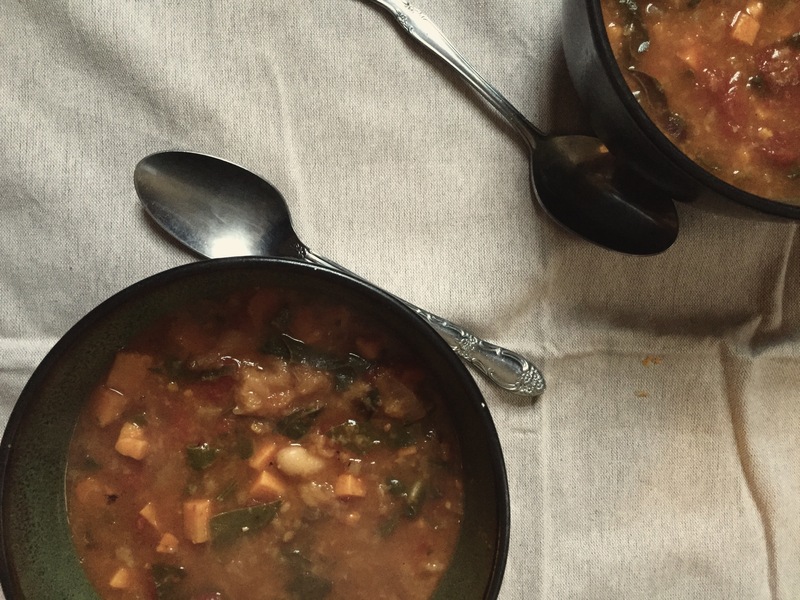 Ribollita is a Tuscan soup similar to minestrone, and is the perfect vehicle for leftovers. To make ribollita you make a brothy soup full of veggies and then add in torn pieces of old, stale bread. It sounds weird, I know. But the bread first softens, then falls apart. It thickens the soup, and any pieces that don’t dissolve completely are little pockets of soup-infused custard. It’s perfect for the half loaves of bread that you may have laying around that are too hard to eat but you can’t bear to throw away because that’s wasteful. It’s economical, because assuming you have stale bread, tomatoes, and some vegetables you can just throw it together with what you’ve got on hand. It’s warming, which is perfect for January (this weekend’s highs are in the single digits here in Minneapolis) and nutrient dense, which regardless of your stance on resolutions is a good thing this time of year. Ribolitta’s a formula more than a set rule of ingredients, so you can mix and match as you wish. I will say that this version, with sweet potatoes, fennel, and Swiss chard brightened with orange zest and juice, is very good. It makes keeping healthy eating resolutions, if you’re the kind of person who makes said resolutions, very easy. And if you’re not into resolutions it makes a great dinner. If you’re making any resolutions this year I’d love to hear them. Wishing you warmth and success this weekend. I used fennel here because my grocery store didn’t have celery. (I know. Is that even possible?) I love the sweet, anise note it brings. If you don’t love fennel or can’t find it, celery would work admirably. I added the stems of the Swiss chard for an extra nutrient burst and because the colors are so beautiful and I would recommend you do the same- they’re reminiscent of slightly tart celery. In a large pot, heat the olive oil over medium heat. Add the onion, carrot, fennel, and chard stems and stir to coat well with oil. Sprinkle with a pinch of salt and a shake of red pepper flakes. Let cook, stirring occasionally, until softened and taking on some color, about 10 minutes. Stir in the sweet potato and can of tomatoes, being careful to scrape up any bits on the bottom. Add the water and the swiss chard and bring to a boil. Add the bread pieces, the beans, the orange zest, and a teaspoon of salt. Reduce the heat and simmer, stirring occasionally, until the bread is almost dissolved. Be careful not to let it burn. When the bread is soft and falling apart squeeze in the juice of half the zested orange and stir in the red wine vinegar. Taste and adjust seasonings as necessary. It should taste bright but not overpowering. Enjoy hot.